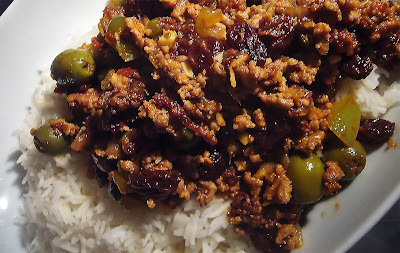 Few nights ago I was browsing the website of my friend Bren Herrera when I stumbled upon a video tutorial on how to prepare a staple Cuban dish: Picadillo. Watching it I found that the combination of ingredient can easily be mistaken for a Sicilian dish; I was particularly struck by the use of green olives and raisins (that we use also in Sicily for a recipe calling for salted cod). So tonight I decided to give it a try and here you are the first draft of its recipe. Heat the oil in a pan and brown 1/3 of the minced meat. When the meat will be nicely brown, add the chilli flakes and the cumin to toast them a little. After one minute or so add the onions to the pan and cook them until translucent; add then the rest of the meat breaking it down with a wooden spatula. Stir well around but don't let the meat brown too much, add then the oregano and the tomato purée along with some water. Cover and let cook for 15 minutes. At this point the mixture should be quite dry, add then the pepper, olives, raisins and some water; let cook another 15-20 minutes. Season to taste and enjoy it with some rice or pasta. You may want to reserve 1/3 of the green pepper to add it at the end of the cooking process so to keep its crunchiness. @Bren: The dish I was referring to is a chunky soup we make with salted cod (baccalá). A tomatoey broth with a small dice mirepoix, chunky potatoes, pieces of baccalá, dried raisins and green olives. I guess you can even add some pine nuts to it. It is a dish showing the middle-oriental influence in traditional Sicilian culture.